When Nolan steals food off the counter to eat with no encouragement and Jeremy requests the same meal two days running, I know a recipe is a winner! Jeremy asked me to make tuna melts for lunch last Saturday, but instead of whipping up a batch of the usual flatbreads, I opted to try out a new bread substitute, grain-free English muffins. There are a lot of minor variations on a basic recipe for “Paleo English Muffins” floating around in the aether, but what they all share in common is a simple almond flour-based batter and a stint in the microwave. I don’t know about you, but as far as I am concerned, “Paleo” and “microwave” go together about as well as oil and water; this is a situation of folks following the letter of the law (specific paleo-type ingredients) but not the spirit of the law (high quality ingredients that throw back to our historical and decidedly pre-microwave diet). Our own family does not adhere to a paleo-type diet, since we eat lots of raw milk, grassfed butter and cheese, legumes, and the occasional gluten-free grain, but I prefer to do most of my baking grain-free just because it increases the nutrient-density of what are typically junky, starch-heavy foods. Yes, we should probably give them up altogether and just eat more non-starchy vegetables—I did that for the first 6 months or so after eliminating gluten from my diet, and it definitely helped ease my personal transition. But honestly, I love baking and my family has enough hardships without giving up all the foods they enjoy. 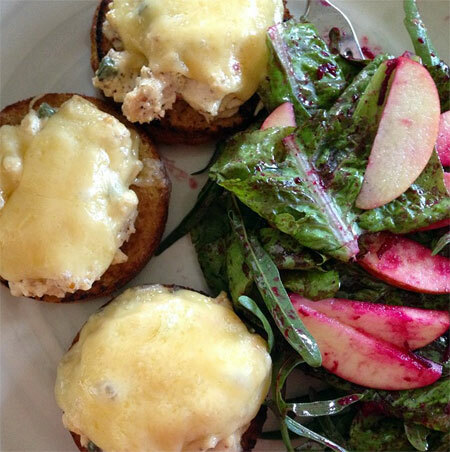 So oven-baked grain-free English muffin tuna melts it is—with a hefty side of salad fresh from our backyard garden (freckled romaine, arugula and shredded baby beet, with purchased organic apple slices). Preheat oven to 400F, and grease 6 1/2C ramekins. Mix together the dry ingredients, then stir or cut in your fat of choice. Whisk together the eggs, water and honey and mix into the dry ingredients (or just throw everything in the bowl if you are in a rush; this batter is forgiving!). Divide the batter evenly between the ramekins, and bake for 15-20min, until firm. Allow to cool for at least 5 minutes before turning out and eating in your desired configuration—tuna melts, breakfast egg sandwiches, mini-pizzas, or just pan-toasted and slathered with nut butter and jam. Microwave option: If you just can’t set aside 20 minutes to bake these muffins in the oven, go ahead and stick one in the microwave for 2-3 minutes; the recipe can be quartered for a single large serving. In my opinion, the color and texture suffer, but if you are going to toast them and slather them with toppings, you might be able to overlook the differences. Of course, if you are that short on time, I highly recommend just cutting an avocado in half and using that in place of bread for your tuna melt! Source: Slightly adapted from Whole Body Health and Fitness. Love this recipe! I have made it twice now and it is a huge hit. I use coconut oil as my fat and recently discovered that the costco near me has organic free range eggs — amazing! Definitely going to share it with my followers. Thank you so much for the delicious breakfast idea! We eat it with an egg wash, fried salami, and avocado on top. Natalie, so glad the recipe was successful for you! Your serving suggestion sounds delicious… I’ll have to try it myself! I doubled the recipe this last time and saved half in my freezer. I think this has become our new favourite instead of pancakes. Sharing it now on my fb page https://www.facebook.com/thepeacefulpaleo Thanks again! i tried this recipe and while it’s a nice snack alternative to those who can’t eat gluten, it in no way resembles an english muffin. it’s closer to muffin texture which i guess i should have figured out ahead of time with the mix of almond and coconut flours. i just think people should know this before using their precious almond flour which is pretty pricey. i served them with homemade nutella and bananas. not bad! Hi Lynne, you’re right–like other grain-free microwave English muffins, these more closely resemble an English muffin in proportions than they do in texture. Of course, if you haven’t been able to eat a gluten-ful English muffin in years, they don’t make a bad substitute! I’m working on some recipes for an English muffin batter that comes closer on texture and maybe even cooks up in rings on a skillet like the real deal. If I have success, you’ll be the first to know! Hi Julie! I love these!! Do you have the nutrition info on them by chance please? Thx so much! I haven’t worked out the nutrition info on these yet, but I’d like to start including this information in my recipes as part of the update to my blog. I’ll see if I can get it added, but in the meantime, a free useful tool you might check out for this purpose is SELFNutritionData: http://nutritiondata.self.com/mynd/myrecipes/edit-recipe You have to create a login password, but then it saves all of your recipe information for future reference. Hope this helps! I’ve made this a few times and am trying to tweak it to be closer to an English Muffin texture and consistency. Have you had any luck with that yet? These seem to be by far, the best & easiest paleo version of english muffins I have found yet. I’ll be trying this for sure! Love this recipe. I’m diabetic and this recipe works for me. I miss white flour and sugar but I’m determine to reverse my diabetes. Julie, I’m very thankful that you worked out a substitute recipe. I like the taste and texture.